We are working to understand the distribution of the fungal pathogen that causes soybean sudden death syndrome (SDS) and root rot of edible bean and alfalfa in Minnesota. Your help is requested. The soilborne pathogen (Fusarium virguliforme) that causes SDS of soybean and root rot of edible bean and other legumes is spreading in Minnesota. Our study has the goal of monitoring and mapping the presence of this pathogen in soybean, dry edible bean, and alfalfa production fields across Minnesota. We request help with sample collection from your area. We would like to obtain samples from 2 -4 different fields in counties which have not had documented findings of SDS or the pathogen. We want to focus the sampling of soybean from Northwest and Central MN. Thus, we would like plant and soil samples from the following counties: Aitkin, Anoka, Becker, Big Stone, Carlton, Carver, Chisago, Clay, Clearwater, Cottonwood, Crow Wing, Douglas, Grant, Hubbard, Isanti, Kanabec, Mahomen, Mille Lacs, Lyon, Morrison, Norman, Pine, Pipestone, Polk, Pope, Rice, Rock, Sherburne, Stearns, Stevens, Todd, Traverse, Wadena, Wilkin, and Winona. We are interested in samples of edible bean or alfalfa samples from anywhere in MN. Collect 5-10 plants showing stunting, yellowing/browning on leaves, or root rot from each field. 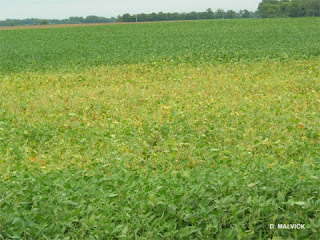 Symptoms of SDS on soybean are interveinal chlorosis and necrosis on leaves and root rot. Symptoms on dry bean and alfalfa may only be root rot and plant stunting or yellowing. Please dig plants and place roots (with soil attached) in a plastic bag. Send as much of the taproot as possible. Don’t enclose leaves in a bag). Place in a box and ship for arrival in St. Paul within 3 days. Also send 2 – 3 cups of soil by sampling adjacent to plants from different spots around the field in which plants were collected (for example 10-15 different soil cores). Please collect samples by the end of August if possible, but sooner is better than later. We will use laboratory methods to test for the presence of Fusarium virguliforme in plants and soil. Results will be shared with those who submit samples. Thank you in advance for your efforts. With this project we expect to have a better understanding of the spread of this pathogen and the diseases is causes. This will lead to improved understanding of risk and disease management. Please don’t hesitate to contact Dr. Dean Malvick (dmalvick@umn.edu) with questions or help with shipping of samples.